Hello, I created https://www.reddit.com/r/womensportsnews. You are welcome to cross-post news about women's rugby. Have fun! 19 player squad announced for the Barbarians match against the US next month. Presumably more names to be added when they are known. There are nine nationalities represented, and personally I'm happy to see Dutch prop Samantha Martinez Gion included. A big honour for her. Gill Bourke (Stade Francais & Ireland) 51 caps, Amelia Buckland-Hurry (Bristol Bears) 0, Alisha Butchers (Worcester & Wales) 25, Dalena Dennison (Warringah & Australia) 12, Fiao’o Fa’amausili (Auckland Marist & New Zealand) 57, Carmen Farmer (Glendale & USA) 11, Paula Fitzpatrick (St Mary’s & Ireland) 40, Samantha Martinez Gion (Amsterdam & Netherlands) 4, Linda Itunu (Ponsonby & New Zealand) 40, Heather Kerr (Darlington MP & England) 16, Steph Te Ohaere-Fox (Christchurch & New Zealand) 25. Andrea Burke (Capilanos & Canada) 38, Julia Folk (Castaway Wdrs & Canada) 5, Emma Jensen (Hastings & New Zealand) 49, Jasmine Joyce (Worcester & Wales) 15, Helen Nelson (Montpellier & Scotland) 20, Elinor Snowsill (Bristol Bears & Wales) 51, Hannah Stolba (Glendale & USA) 12, Amanda Thornborough (Westshore & Canada) 28. Seeing how Italy performed in the 6N it would make sense to include one or two, so maybe that is the reason. There must still be a couple of names to come though, so who knows? Prior to this match, at 12:00 CET, there will be a game between a B-team ("España Emerging", although with some capped players) and Liga Iberdrola All Star. -RE streaming is working for me. Not enjoying it much though. 19-0 at half time, and I think it is only going to get harder for the Dutch in the 2nd half, they have had very little possession. FT 54-0, if anybody wondered. 8,900 spectators according to FER, but as entrance was free who knows. Anyway a huge crowd and a great atmosphere, so a brilliant marketing stunt success for our union. 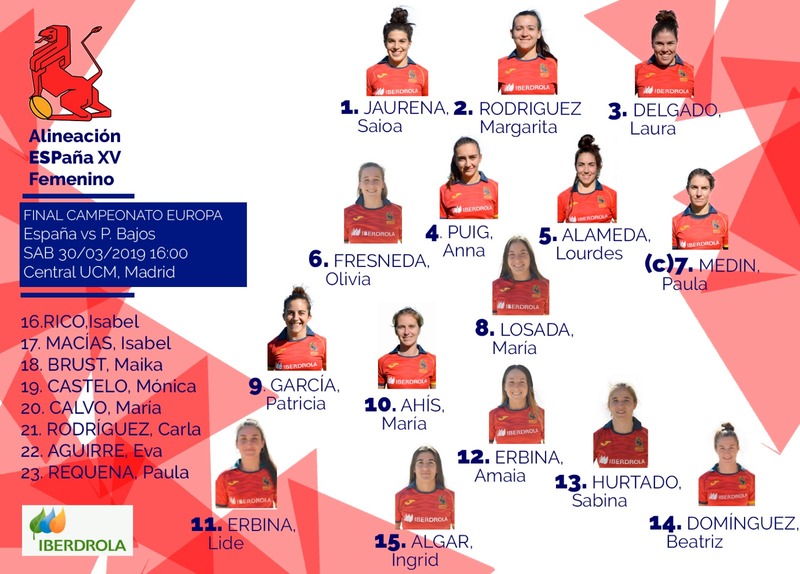 They make Iberdrola and Renfe (sponsors) happy, they keep growing the fanbase so it responds when WRWC qualifiers come (a big concern for head coach) and they send a message abroad that there is a bigger market here than in established nations. 7/8 on conversions is rare for women rugby; maybe they were all tries under the posts, though, I haven't seen the game. FER could think to host the WRWC; the Complutense stadium seems perfect at least for the pool phase. Maybe could they plan some pools in Madrid and some in the not too far Valladolid, which should be a sort of rugby town in Spain? Canalina wrote: 7/8 on conversions is rare for women rugby; maybe they were all tries under the posts, though, I haven't seen the game. Most were pretty straightforward, but not all. But there are pictures of Patricia Garcia practicing her kicking three hours before the start of the game - and she is a pretty amazing player. Probably the greatest advert for rugby in Spain (women or men). Something like that was one of the early bids for 2021, but was later withdrawn. The Women's rugby continues to take positive steps in the region as well as in the world and in Asunción of Paraguay, the next 25 and 26 of April, will be held the First Women's Forum of Rugby spupported by South America Rugby. Katie Sadler, General Manager of Rugby Women of World Rugby, who will take advantage of the trip to Asunción and will visit for the first time to different countries of the region. Víctor Luaces, Secretary of South America Rugby, highlighted the importance of this first Forum. "For our region, to be able to continue growing and advancing in everything related to the integration of women is of great importance. Big news in Spanish rugby as Autoconsa El Salvador earned promotion to Liga Iberdrola after beating Les Abelles 24-20. That means one of the main clubs and the key rugby city in the country reach top level national women's rugby. I believe it was their fourth straight final and through the years they've managed to attract a lot of talent from smaller regions without access to higher standards of the game, so huge opportunity for all the country.